Here is this week's episode in the Table Top biweekly series hosted by Star Trek's Wil Wheaton on Felicia Day's Channel Geek and Sundry. 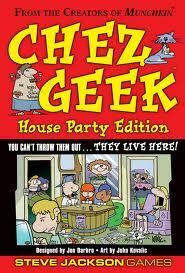 This week it's the classic Chez Geek from Steve Jackson Games. Join me in watching Wil and his guests: Storm DiCostanzo, Andrew Hackard, and Paul Sabourin have a humorous time playing deadbeat roommies in a slacker's life of beer, nookie, bad jobs, and more. Who is the best slacker and out-slack's them all to win Chez Geek?